LURM to create ripples of ecstasy through its revelry in Jaisalmer…! LURM 2016 is a new rage among youth as the festival hits the commoners amidst beautiful Sam Dunes this December. Basis its extravagant facets a perfect blend of food, music, fashion, film, adventure, camping, beer and wine will be observed at the carnival. Spread across 34 acres of land, the place overtures more than 2000 camps to get hold of almost 13000 people. While close to 200 films from 15 different countries shall constitute the cinema part, nearly 100 food outlets would exhibit the best of the cuisines from all over the world. The target audience implicates only adults from the tier-1 or tier -2 cities while tourists from China, Japan, European countries are also going to be there. All sorts of music be it EDM, Sufi, Classical etc are going to make highlights owing to presence of all renown names such as Bemet, Twistedbass, CAS, UD & Jowin, Genus, Beyond 120, Nosh & SJ, Dilshad Khan, Tritha, Ustad Anwar Khan Manganiyar and group from Barmer, Sikar Gharana Ensemble, Imran and Friends, Aagamya, Across the Line, Ceaseless Juncture, Underground Authority, Dj Fintushami from Russia. In fact the National Award winning melody maestro Imran Khan says being associated with LURM “mainly because of varied music range which no other festival has ever done” He further looks up to his performance at the beautiful city, Jaisalmer. Undoubtedly, the festival has everything under one roof as it also bids for ‘Paramotoring’, an enthralling adventure aero sport with adequate safety measures. The mind-blowing fashion bazaar offers handcrafts, jewellery, footwear and other exclusive merchandise. Most of the popular names like the Mumbai festival, Book My Show, Red FM, 9XO, The logical Indian, , Elixir Coterie, Piggy Bank Films, Creative Karma and Thestorehunt.com are leading partners of the whole affair. Not to forget, LURM is according each possible aspect of ‘sensible partying’ and CSR activities. Where merrymaking and cleanliness do not go hand in hand very well, LURM Festival 2016 assures the prospect and takes up the heavy challenge of doing just the opposite. Irrespective of being a high power entertainment event, no use of plastic is encouraged; littering is not excusable and will attract penalty. Festival team is taking extra measures to save paper to the optimum level – tear their business cards or event tickets; you will get a seed to plant a tree. No brochures will be given out for event details, everything will be digitized – on app and on screen details during event. It will even establish water purifier systems to provide water for no cost. Also each item available at the festival is completely saleable whilst the sale proceeds move to concern artisan. You now know where all roads leads to this December – to India’s first travel destination event with such high ecological concepts with equal value for entertainment. Be ready to party hard while taking care of Mother Nature. Posted in Art & Culture, Events & HappeningsTagged Art & Culture, Cultural Festival, Desert Camps, Desert Festival, Dune Festival, india Travel, India Travel Blogger, Indian Tourism, Jaisalmer, Jaisalmer Fest, Jaisalmer Festival, Lurm Festival, Lurm Festival Jaisalmer, Musical Festival, Sand Dunes, Tourism, Tourism Festival, Travel Blogger, Travel DiariesLeave a Comment on LURM to create ripples of ecstasy through its revelry in Jaisalmer…! A Kiwi’s Antar Yatra- An Intimate Pilgrimage You Need To Know About…!! Travel has always been an integral part of every religion and not everyone is acquainted with the fact. Irrespective of the religion, pilgrimages have always been designed in such a way that the pilgrim encounters new experiences away from his/her vicinity. People are caught up so intricately in the web of life that they forget to see the world and explore a new perspective. A pilgrimage is one strict reminder. Kevin Duggan woke up to a similar reminder when he decided to visit India a second time. The same place where his sister Karyn Duggan had lost her life in 1998. Kevin had come a long way from New Zealand with his bike to traverse a considerable part of the Lesser Himalayas. He had many unanswered questions and bringing a companion along would have defeated the whole purpose of the trip. Even after facing objections from his dear ones, the 53 year old set afoot on his journey alone! He cycled along Shimla- Narkanda- Rampur- Tapri- Reckong Peo- Spello- Pooh- Nako- Tabo- Kaumik- Kaza- Battal and all the way to Chattru in Spiti Valley. A 900 kms stretch on two wheels through mettle testing terrain. His idea was not to cover the distance from Point A to Point B but to ‘live’ the experiences that came along his way. Roadside workers inviting him over lunch, random stranger trekking a 50km patch over a mountain pass with him, pedestrians shouting out ‘Julley’ and many more overwhelming experiences is what emblazoned his quest. The ‘India’ Kevin had imagined ten years ago, was quite the opposite in reality now. He felt spiritually connected to the place and feels that some part of his sister is still in that valley. It was a mental challenge for Kevin to come back to India. He believed that harder the challenge is, greater efforts are required but if you meet that challenge; greater the rewards! His rewards, as he genuinely puts it were, “meeting you (the 4Play.in Team) guys and having seven adopted Indian sons”. Everyone has a different way of traveling, some travel in groups, some aim in covering different spots on the globe but for Kevin, travel has a lot different meaning. Keeping himself in shape is what has helped him discover the world the way he wanted to. Made of true grit and due to a passion for the outdoors, Kevin Duggan still going strong at the age of 53. Having completed one of the most prestigious endurance races on the planet, His quest for exploration has attained an undying character. Working regularly on his fitness level, he is quite a challenge to the status quo of modern athleticism. Here is a video showcasing Kevin’s intimate pilgrimage journey. The video is created by 4 Play. 4Play is India’s first adventure sports channel which curates stories from the outdoor extreme and adventure sports. They are the outcome of roughing it up in the outdoors, living on the cutting edge of what may be termed as extreme, and basking in the experiences that came along. For more interesting stories log on to http://4play.in and witness adventure sports like never before. Posted in Entertainment, Expressions, Short Story, TravelTagged 4Play, Adventure Sports, Adventure Travel, Adventure Video, india Travel, Lifestyle Blog, Lifestyle Blogger, Pilgrimage, Short Story, Travel Blog, Travel Blogger, Video, Video StoryLeave a Comment on A Kiwi’s Antar Yatra- An Intimate Pilgrimage You Need To Know About…!! Chandigarh: Led by His Holiness the Gyalwang Drukpa, of the Ladakh based Drukpa Order, 500 monks and nuns cycled into India and reached Chandigarh as a part of their 2500 km journey to Hemis Monastery in Ladakh. The Drukpa Order, which has come to be known for its insistence on gender equality and celebration of diversity regularly organises such events to highlight issues of global significance. The Cycle Yatra, which commenced in Kathmandu (Nepal) on 3rd July 2016 from one of the monasteries of the Drukpa lineage, has become an annual feature of Order’s efforts to promote awareness about the Environmental Crises in the region and inspire collaborative action to resolve it. The two month long Yatra traverses through some of the most arduous routes in the Himalayan region amidst adverse conditions. From the quake-hit regions in Nepal, to the monsoon hit towns in Uttarakhand, Punjab, Haryana, Himachal Pradesh, Pathankot, Srinagar, Sonmargand Kargil (J&K) – The Yatra will culminate at Hemis Monastery, 45 kilometres from Leh. Where it is scheduled to arrive, prior to Naropa 2016 – a grand spiritual festival that is held once in every 12 years, celebrating the 1000th birth anniversary of the Indian Saint Naropa, patron of the Drukpa Lineage. “The Himalayas have been the home of the Drukpa Lineage for over 1000 years now. Recently, the region has faced several environmental disasters that caused unwanted &unprecedented loss of life and upset the natural ecosystem. Our aim through this journey is to inspire people to be one with nature instead of being in a constant state of war with it. The Himalayas and the earth were formed millions of years before we were and it is our duty to respect them,” said His Holiness the Gyalwang Drukpa – the 12threincarnation of the head of the Drukpa Order. His Holinesshas personally led the Cycle Yatra from Kathmandu and plans to complete 2500 kilometres all the way to Hemis Monastery in Ladakh – shattering the conventional concept of the role of the spiritual Guru.It is through his vision that the number of women being inducted into the Order has increased manifold since his accession. The nuns of the Drukpa Order are instrumental in the activities of the Lineage across the Himalayan Region and are fondly known as the ‘Kung Fu Nuns’ for the role they have played in resolving on ground issues. For his tireless efforts, His Holiness has been conferred the title of ‘Keeper of the Himalayas’ by the United Nations. The Drukpa Lineage (the “Dragon Lineage”) is an integral part of Himalayan and Central Asian legacy and culture. Dating back to the Indian scholar-saint Naropa, the Drukpa Lineage is woven into the history of Buddhism the geographic locales of India and Central Asia. It is strategically located along some of the world’s most significant historical trading routes and has over 1000 monasteries in the region. The state of Bhutan, honours the Drukpa Lineage as its state religion. The present Gyalwang Drukpa is the twelfth reincarnation of the founder of the Drukpa Lineage, whose tenant of “service before self” and their zeal to convert compassion into action to tackle international challenges has earned the lineage a robust global following. 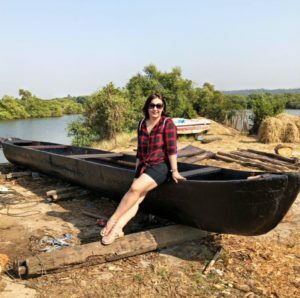 Here is a very interesting travel story shared by Rebecca, enjoy! Currumbin Wildlife Sanctuary is one of the Gold Coast’s top tourist destinations. About an hour’s ride on the bus from Surfers Paradise where we were staying or about 18 minutes if you drive. In Currumbin, you can see a wide variety of native Australian animals and birds from wombats to kangaroos, koalas, parrots, and the famous Rainbow Lorikeets. Feeding the Lorikeets is one of the highlights of the day. The feeding times are 8:00AM and 4:00PM. Guests hold out a dish of bread and water and they will come to eat and splash. The Rainbow Lorikeet is an Australasian parrot which is also found in Indonesia, Maluku, and Western New Guinea, Papua New Guinea, New Caledonia, the Solomon Islands, and Vanuatu. It is mainly found along the eastern coast. It lives in rain forest, coastal bush, and woodland areas. Burgeoned alongside the western coast of Southern India in the North Kannada District of Karnataka State, the quaint town is pilgrims’ paradise & beach-lovers heaven. Bestowed with pristine beaches and timeless temples of Hindu deities like Lord Shiva, Lord Maha Ganapati, Goddess Bhadrakali and many more, Gokarna is termed as the ‘Kashi of South India’. Legend has it that Lord Shiva emerged here from Cow’s Ear – the cow being Prithvi1 And since then the temple town has been christened as Gokarna. The Mahabaleshwar Temple dedicated to Lord Shiva is constructed in a Dravidian architectural style. It houses ShivaLinga2 and a 1500-year-old idol of Lord Shiva. Since centuries the temple has been witnessing priests, pilgrims and monks submerging themselves in religious rituals, offering prayers, meditation or performing religious ceremonies. The temple is abuzz with holy hymns and chants that emanate somniferous spirituality. There is an air of peace and serenity in every corner of the temple and a visit is enough for the visitor to get the soul rejuvenated. On an average day, the tinsel town wakes up by early sunrise. The two main streets that connect the town with surrounding districts are thoroughly washed and the residents then adorn it with Rangoli3. Holy chants begin resonating from every household and the fragrance of incense sticks fill the atmosphere with mystic peace. It seem like the whole town has woken up from a deep slumber only to transcend in spirituality. Sandwiched between the hills and seas, Gokarna is blessed with four scenic beaches namely the pristine Om Beach, the quaint Kudle Beach, Half-moon & Paradise beach. White sands, crystal clear water and serenity of Om Beach beckons every backpacker. Its two semi-crescent shores that are naturally joined together, resemble the Hindu religious symbol ‘OM’ and the only how the beach got its name. A short walk away from the Om Beach is Kudle beach that has graduated as a surfing destination and provides perfect waves for the surfboard to flirt with. The other beaches like Paradise Beach & Half-Moon Beach are nestled in a secluded location with fewer inhabitants. The laid back nature, scenic locales, captivating ancient temples and virgin coastline places Gokarna in the bucket list of every tourist as a must see destination. And its epiphany sunsets, sun-kissed warm sands, breezy twilight, percussion of waves are a few daily shows performed by the Mother Nature that renders every traveler spell bound.